If you are ever having car trouble, the first of all line of hope is that the problem is something small, inexpensive and reasonable to fix. It’s a source of stress and frustration to have your car malfunction when you have daily responsibilities like going to work, school, grocery store and more. Not having a car can make the simplest of errands an enormous inconvenience. The last thing you want to hear from any auto mechanic is that there is a crack in your engine block. This can lead to your car being completely taken out of commission. 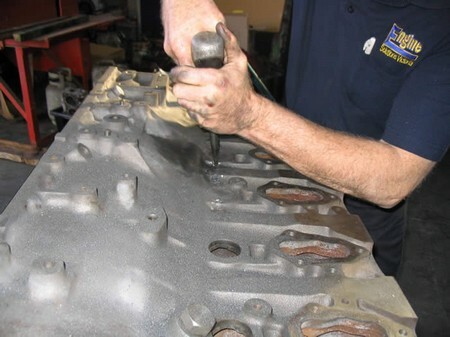 Here are some options on how you can repair and engine block crack. Once you diagnose the car has a crack in the engine block, you want to call in some help. This is not a job for the hobby mechanic. You will need certain tools to complete this task and it is unlikely you’ll have them sitting in your personal garage. Call your local auto shop and get an estimate and make a date to have the car brought in to be looked at. When the engine block is cracked, this leads to the block also being magna fluxed and hot tanked. You’ll have to clean the block and then inject some UV dye to ascertain exactly how bad the damage and cracking is. The number one question is whether it can be fixed. This all depends on where the engine block cracked and how deep. What kind of block so you have. There are aluminum and steel blocks. Pieces that are made cast iron are not able to be welded. They keep their shape and endure the wear and tear of everyday automobile use. Some auto mechanics will weld the area and then grind it smooth with the surrounding area. You want to be able to still keep gap spaces accurate. If the damage has occurred in the cyclinder wall. A sleeve can remedy it. However, this sleeve also requires different sized parts are use. The costs of these kind of repairs vary greatly. You should shop around for estimates before deciding on one place. Also, consider replacing the motor. This may be an even more cost effective solution than repairing the cracked engine block. You may be able to get a motor from a pull a part place or junk yard. There may even be a warranty on it if the engine comes from wither of these places. Cracks can recur after repair. Weigh all your options before making a solid decision on such a major repair. Cost and the reasonable chances of recurrence should weight heavily.